The Haskell embedded DSL Accelerate is such a language. It enables application programmers with relatively little knowledge of parallel computing to write programs accelerated by multi-core CPU and GPU architectures, even beating hand optimised code for typical applications. In this talk, I will give an overview over programming in Accelerate, demonstrate some applications, and show how advanced features of the Haskell type system, like type families, play a crucial role in the implementation. 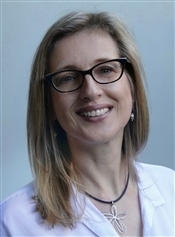 Gabriele Keller has recently been appointed as chair of the Software Technology Group at Utrecht University. Before moving to the Netherlands, she co-founded the Programming Languages & Systems Group at the University of New South Wales, and was a Principal Researcher at Data6 (formerly NICTA) in the Trustworthy Systems project. She contributed to the design of type families in Haskell, and is one of the co-authors of the paper Associated Type Synonyms, which won the ACM SIGPLAN Most Influential ICFP Paper Award. She co-developed leading Haskel high-performance array frameworks, including Repa and Accelerate. Her research interest are type systems, functional languages, and how these languages can be used to reduce the costs of software development, in particular in the context of high-performance computing and safety critical systems.